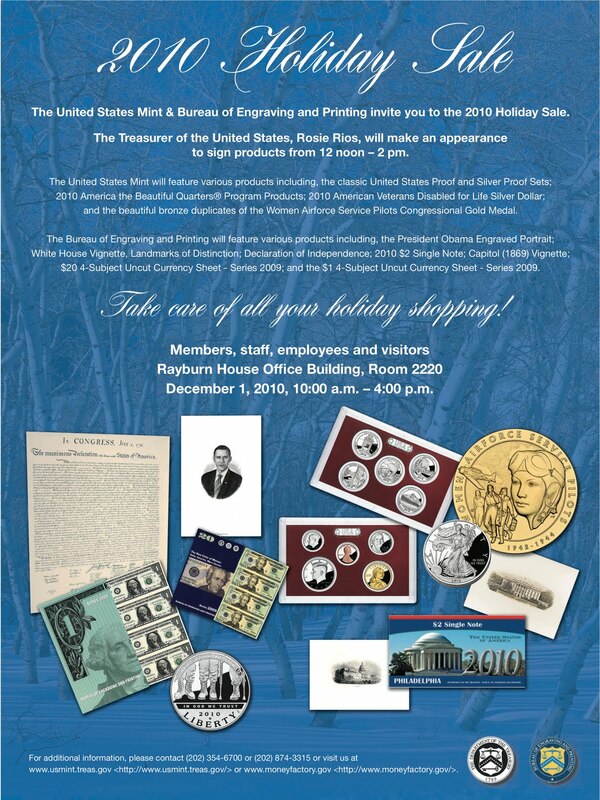 If you happen to be in the area of Capital Hill in Washington, D.C., the U.S. Mint and Bureau of Engraving and Printing are holding a sale at the Rayburn House Office Building today (December 1) in Room 2200 from 10:00 AM until 4:00 PM. The building is open to the public (your representative to congress may have an office in the building) and requires airport-style screening, sans the pat down! Both agencies will have their 2010 offerings for purchase at regular prices. The difference between purchasing it from a clerk instead of mail order is you do not have to pay postage or worry about your order being cancelled. Besides, you never know who you will meet in the hallway, especially since congress is in session. Also, Treasurer of the United States Rosie Rios will be there to autograph products from Noon until 2:00 PM. The Rayburn Building is located at 45 Independence Ave SW, Washington, D.C. between First Street, SW, and South Capital Street, SW. The closest Metro stop is the Federal Center SW or Capital South stations. Both are on the Orange and Blue lines.